Freshly produced PCB in hand, it is now time to solder the electronic components. Soldering is tricky. Repetition is key. I am beginning to find an effective method varying my practice, trial and error. 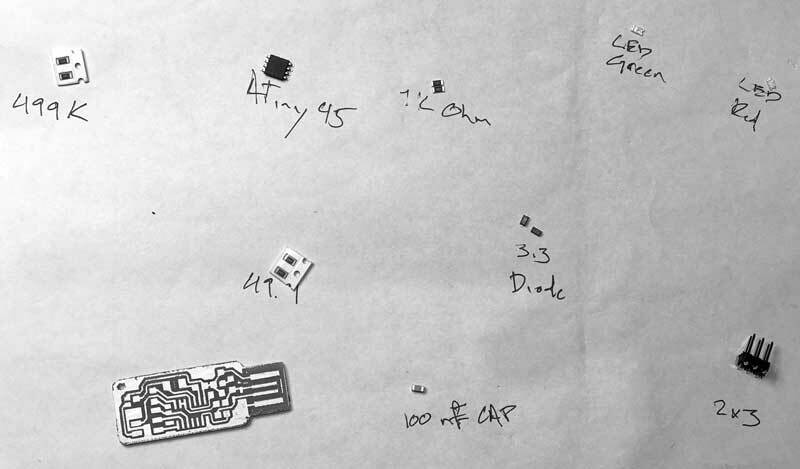 This is a road map of component placement from the FabTinyISP page. First, gather the components, or do not. I soldered two boards. The first, I gathered everything beforehand, the second time I grab componenets from their storage as I went along. Whatever, both worked. Just be careful not to lose any or return to the wrongly marked storage. The microcontroller and diode components are directional; all others are nonspecific. Preheat your soldering iron to around 400 Cal and make sure the tip is clean. 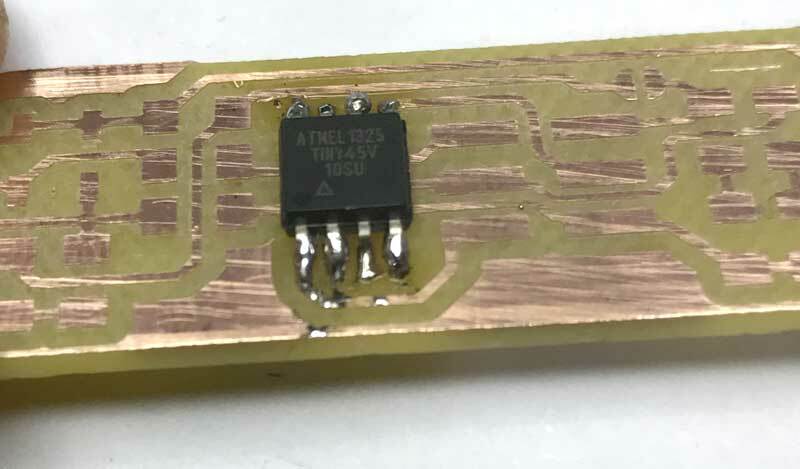 When soldering heat the the tip of the connection, not the solder, then apply the solder. 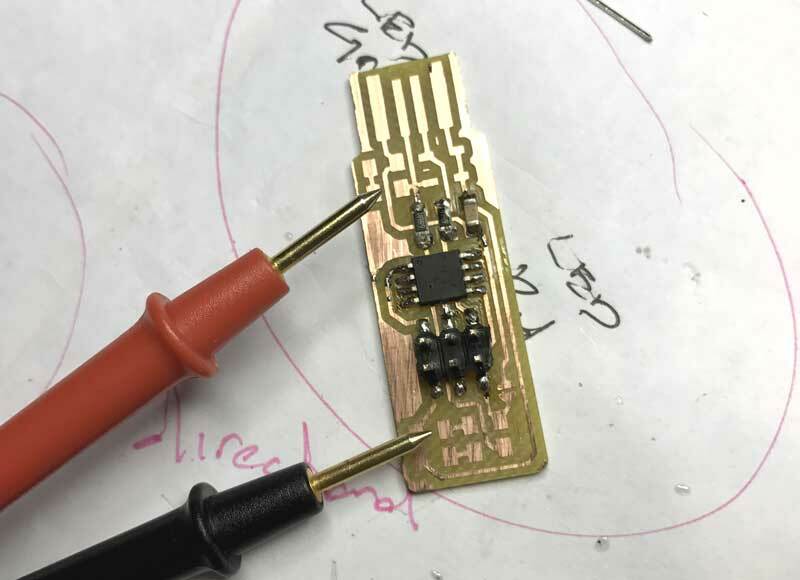 Start by flowing a small glob of solder onto one of the pads connected to a compoonent. Gently press the soldering iron onto the pad and after a couple seconds, apply some solder to the iron. If the copper is adequately heated, the solder will magically move from the iron onto the copper. If the solder bubbles, the copper is not hot enough. 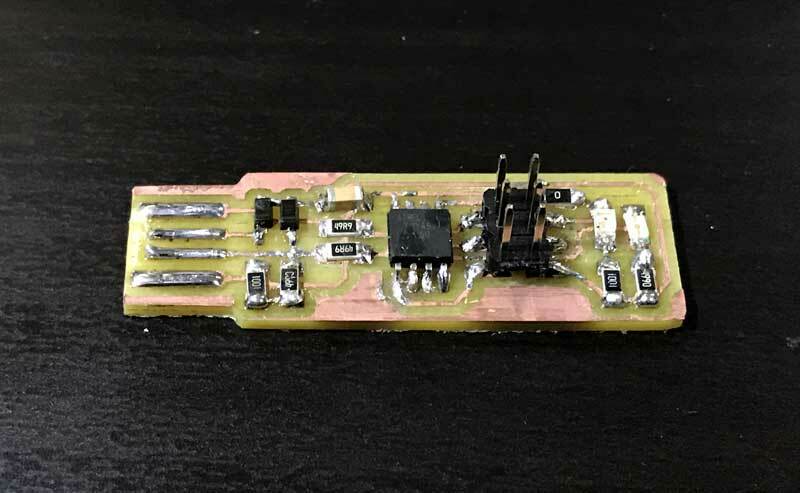 Grab the electronic component, this time the ATtiny45, microcontroller, with some tweasers, reheat the applied solder glob with the hot iron and slide the microncontroller into position in the solder. The microcontroller is directional, align the small dot on the microcontroller to the roadmap. With this action, the component is tacked in position. 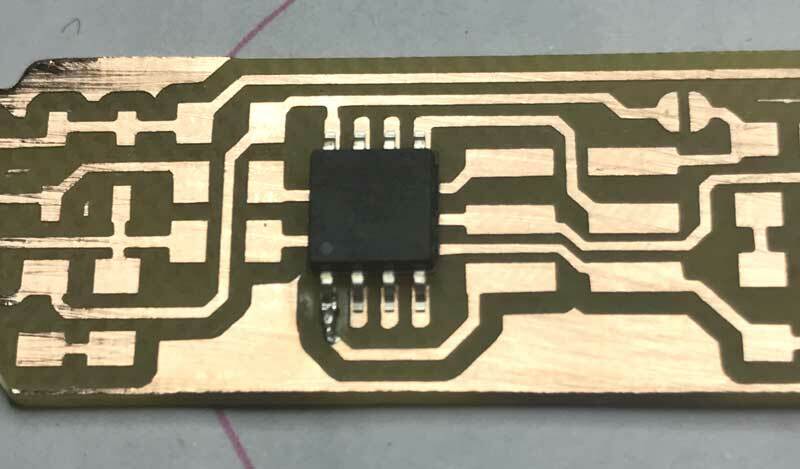 Next, press the soldering iron tip onto the pad and electronic component connection, simultaneously heating both. After a couple seconds, add solder. The solder will flow into and around well-heated connections. After adequate solder is flowed, remove the solder, then the iron. Good joins have a flat electronic component and shiny solder completely wrapping the connection. Bad connections can be reheated and fixed. Components can also be removed by reheating the connections and pulling the components from the board. When all the connections are soldered, remember to flow the first tack spot. I started with the microcontroller because it is the most difficult to solder. Next I did the ISP which is also difficult. As I soldered components, I checked their connections with a multimeter. I put the multimeter to the check mode with sound. Follow the traces to check connectivity by pressing one wand to the connection point and the other further along the trace. Sound means connection. 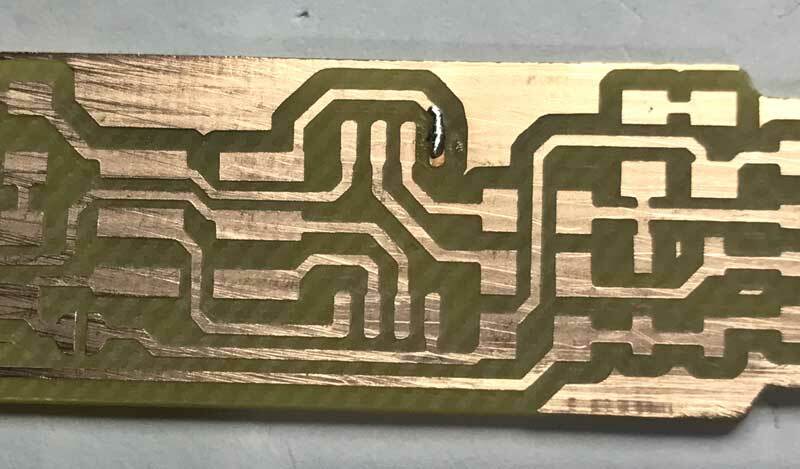 If that connection is undesired, check for extra solder. If no connection, re-flow solder at the intended connection. After about an hour of soldering and testing, I have what I hope will be an operational programmer. My second go around. I added solder along the USB leads to improve connectivity. 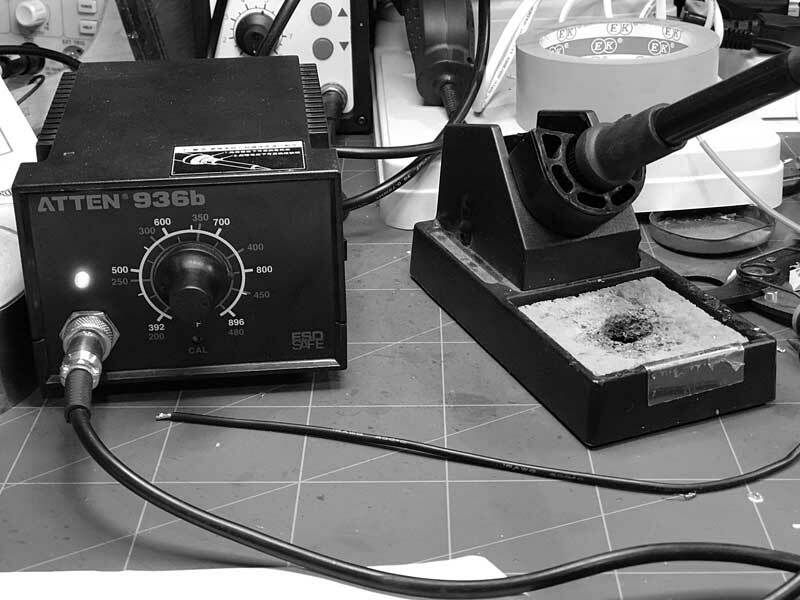 How to Solder Electronic Components : Simple detailed instruction on soldering for beginners.